With my new weekly food boxes I am getting loads and loads of foods I wouldn’t go out and buy on a regular basis, which is forcing me to experiment more, vary my vegetable sources more, and to get a little bit more creative with my meals to make sure I don’t let anything go to waste. With our second shipment of rainbow chard I figured it was time to see what else I could do with this delicious green besides juicing or sautéing. 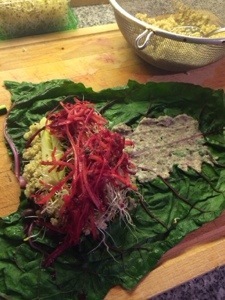 So I got on the internet and started researching how to make a gluten free wrap with the leaves of the chard and what I made was so delicious. Now there are many components to the wraps I made, however you can make it as simple or as complicated as you would like. But if you are going to make this recipe I would recommend maybe trying it on the weekend or when you have a bit more time on your hands. With making the slaw, bean spread, quinoa etc. it took me about an hour and 20minutes before I had a final product for eating. I am sure this would go a bit faster if you had a friend helping you chop everything up so if you have the opportunity get your friends involved. Now let’s get down and dirty, here are all the fixings for the wraps. Also a little side note the black bean dip is DELICIOUS with veggies, so if you have extra don’t fret just chop up some carrots and enjoy. 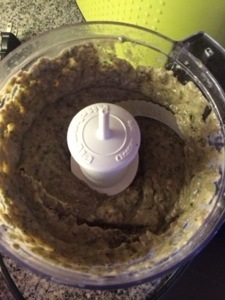 Blend in food processor until smooth set aside until assembly. 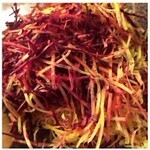 I used a mandolin to chop the beet and carrots into match sticks, but you can also use a grater or if you want to take the time to chop it all up by hand that is an option too. Once everything is chopped, juiced and ready combine all raw ingredients into a large bowl. Add parsley, salt and pepper and toss. Set aside for later. 1 cup Quinoa cooked according to package. Any other veggies you like, sliced for easy rolling. 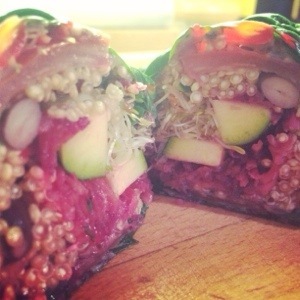 Prepare and set aside for wrap making. Chop off the hard ends. 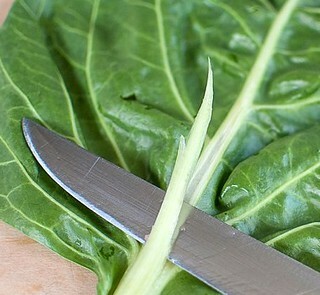 Flip the leaf to the vein side and slice off some of the thick stem end, this will help you to wrap them. Get water boiling in a large pot and fill your sink up with freezing cold water. Blanch the chard leaves. Place the leaves in the boiling water for no more than 2-3minutes, then immediately transfer them into a cold water ice bath. I did this with one leaf at a time so that I had a bit more control over the cooking time. 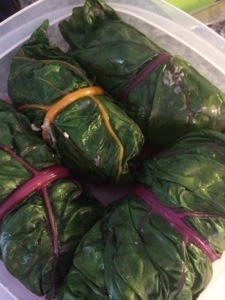 Dry them off and get ready to assemble your wraps. 1. After drying off the leaves lay them flat on a cutting board or other hard surface. 2. Spread the bean dip down the center of the leave and then I would recommend placing quinoa and beans first so they kind of stick to the dip. 3. Add all other fixings, zucchini, sprouts, carrot slaw and wrap. Starting at the end with all your fixings fold over the sides (inward) and being rolling. You will want to keep curling in the outer edges so you get a nice tight wrap without anything falling out. The first one might feel like a disaster but trust me you will get the hang of it. I ate mine with a fork and knife but if you want to get in there and get dirty feel free to attack these bad boys with your hands. Happy Friday! I hope you enjoy these veggie packed tummy filling meal. 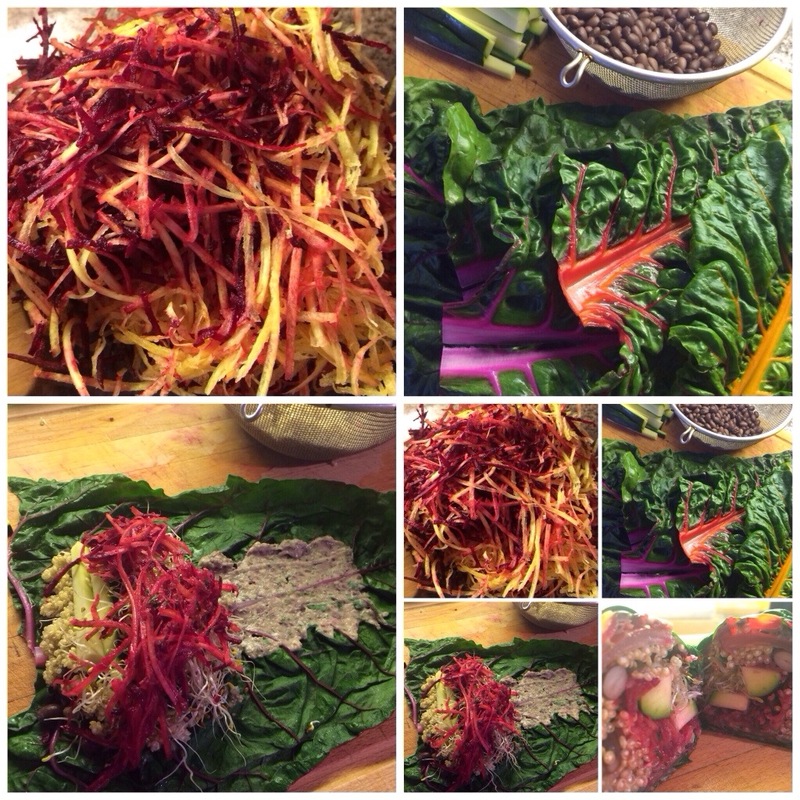 This entry was posted in Food and tagged 100 days of clean eating, beans, carrot and beet slaw, clean eating, dairy free, quinoa, rainbow chard, vegan by healingginger. Bookmark the permalink.